While there is quite clear list of what makes software completely portable, some parts are grey area. Supposedly portable software, that creates entries in registry, is not only common but is often well accepted. Line is thin between minor entries for convenience and entries that can compromise app’s operation or user’s privacy. RegFromApp is real-time monitor for registry changes by specific process. App has simple interface (not even usual Nirsoft columns, eh). After start you can attach monitoring to existing process or start a new one, so that possible registry entries are captured from the very start. Changes to registry by process are captured and displayed in real time. Output format is that used by .reg files and can be saved in such. Handy if you want to reproduce it later or capture what some Windows tweaker does. Only changes are displayed. So if app does create registry entries, but cleans up afterwards it wouldn’t affect final result. Add OpenedFilesView and you have decent insight in what application does to registry and file system. Capture is stopped when process is terminated. It also seems that app attaches to specific instance of the process and not all processes by that name. Makes it harder to monitor software that splits into multiply threads or runs periodically. 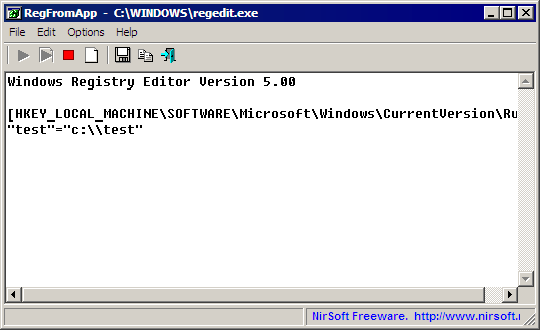 One way to work around that might be using Image File Execution options to set RegFromApp as debugger for executable. Common way to monitor for registry changes is comparing two snapshots – before and after. RegFromApp relies on real-time monitoring instead, which makes it gain in performance but lose in features and flexibility. Drags registry edits from under the hood in plain sight.